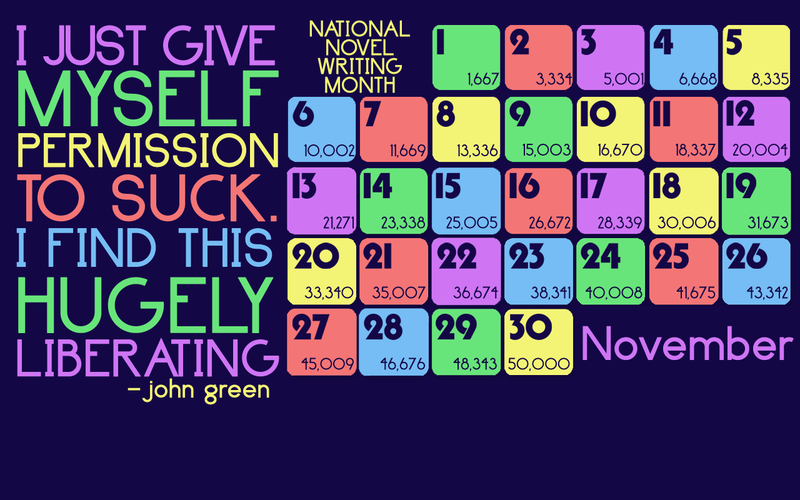 Well folks, we are only 4 days way from everyone's favorite month of the year, National Novel Writing Month! 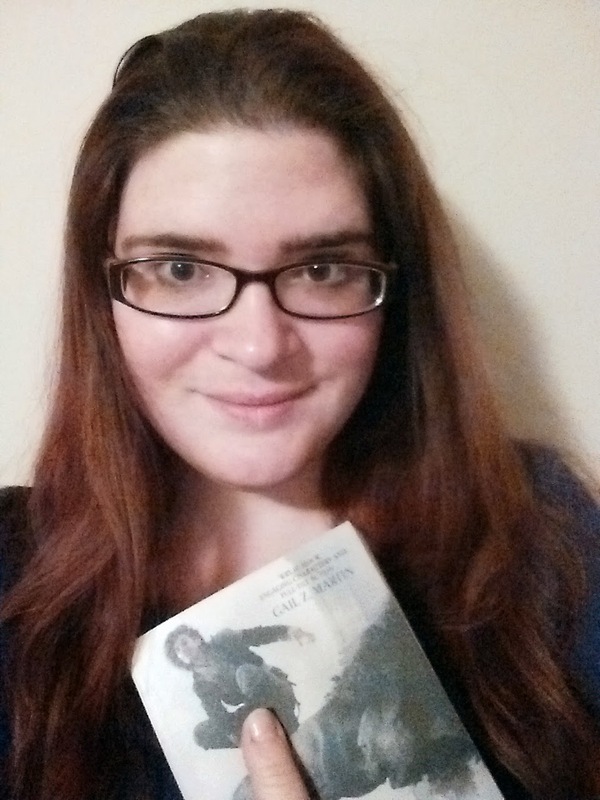 To celebrate, I'm going to be doing NaNoWriMo themed Writing Wednesday posts for the next few weeks as well as my annual Ask Me Anything thread on the NaNo Fantasy forum. It should be good times. 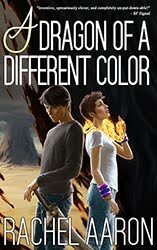 Last week, I talked about getting your characters prepped. This week, with the starting line looming, I'm going to talk about how to actually, successfully pull off the hardest part of NaNo for most people: writing every day. The entire concept of NaNoWriMo is based around teaching people who want to write books how to write daily. On the surface, it's very simple: 50,000 words ÷ 30 days = 1666 words per day. Write that every day, and you'll complete a novel in a month. Lovely as that sounds, though, if you've ever taken a stab at novel writing before, you know reality is rarely that clean and simple. Life is messy. Even with the best intentions, you might not get to write every day, because stuff happens. Even if you do manage to cordon off your writing time every day, stories don't always go as planned. You might spend an hour writing and walk away with -500 words. (Been there, done that). All of these setbacks are a natural part of the writing process, and one of the things I love about NaNo is that it teaches us to keep going anyway, to charge past these bumps and just get that novel done! This is a vital life skill for anyone who wants to write professionally. Like all skills, though, it takes some practice to get right. To help take the pain out of the process (and to put my own failures/learning experiences to good use), I've put together my best tips for how to successfully and reliably pull off this "write every day" thing without driving yourself insane, having to scramble on catch up days, or otherwise resort to shenanigans. I know this sounds like cheating, but hear me out. The point of NaNo is to write 50k in a month, but that doesn't mean you have to write the first 50k of your novel during this time. The beginning of a book is rough. It's where all your big structural problems--errors in planning, unruly characters, plain old bad ideas, etc--first rear their ugly heads. When this happens, the natural thing to do is stop and fix what's wrong before little problems become big problems. This is what I do in my daily writing, but stopping and fixing are often not options in the hectic NaNo timeline. The common advice I see for when this happens is to just press on anyway and fix things later, but I hate doing that. Working on a book that I know has problems feels like building on a shaky foundation. Now, not everyone feels this way, and if you're an author who can just push ahead, more power to you. But if you're like me, and the idea of ignoring problems drives you NUTS, then a fantastic way to get around this issue is to simply start early. By starting writing a few days ahead, you can shake out the worst of your bugs before the real timer starts. You'll also enter NaNo with a much better idea for your book as a whole since you've already had some experience, which will make getting 1666 words a day for the rest of the month much easier. Plus, if you want to stay true to the NaNo wordcount, you can always subtract the words you wrote in October from your NaNo total. 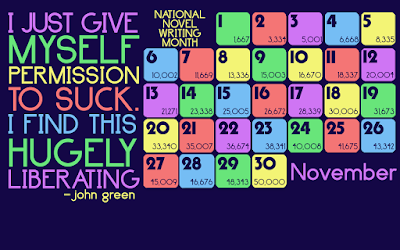 So if you've got your novel planned and you're just waiting for November to tick over to begin...why? It's your novel, why wait? Start now! Hit the competition with a chapter or two under your belt already, and I promise you will have a much easier time getting your 50k. The hardest part of daily writing is getting started. Once you're rolling and into your story, writing is easy. Scenes are flying, characters are talking, everything is going great! This is the sweet spot, and a big key to getting good writing down every day is to spend as much time in this awesome place as possible. Now, obviously, there are days that aren't like this. Some days, just getting to 1666 will feel like a marathon. Even with the best planning, bad days are inevitable, which is why, when you're having a good day, you need to run that sucker as far and long as you can. So if you're in the middle a scene and you're chugging along and you realize you're about to hit 1666, don't stop. Push on to the end of the scene at least. Or better yet, the end of the chapter. That momentum is precious, and you want to milk it for all its worth. Also, if your writing is going so well that you hit your wordccount without realizing it, that's some good writing. Keep it up! One of the biggest hurdles of writing every day is keeping up your enthusiasm. Sure the first few crazy writing days are fun, but no novel is without its bumps, and a few bad days of mauling through problems of your own making can make skipping a day start to sound pretty good. This is a natural human reaction to hardship, and it's one we as writers have to conquer, because one skipped day all too easily leads to many, and the next thing you know, your novel is an abandoned project really through no fault of its own. If you want to avoid this cycle, one of the best things you can do to make sure you're never tempted to skip a day is to take a moment when you finish your writing and jot down very quickly what you intend to write tomorrow. That's it. Just make some notes. Give yourself something to think about and look forward to tomorrow. Anything will work, just make sure you give yourself something to hold on to so you can avoid that terrifying blind "I have no idea what I'm doing" start. Because that feeling right there is what kills novels, and anything you can do to avoid it is time well spent. This is actually a modification of my "Know what you're going to write before you write it" tip from 2k to 10k, and here as there, it works wonders. The idea is you want to preserve as much of your writing knowledge as possible. When you're writing, so much of the story is in your head, and every time you go away from that back to the rest of your life, you fall out of that zone. But, if you take a second to jot down a few of those ideas before you stop writing for the day, then getting back into your story tomorrow becomes that much easier. Even if you look at your notes, decide you were crazy, and writing something totally different, just having those thoughts written down will make diving back into the world of your story faster and and more exciting. Just on a personal note, I use this trick every time I write, and it makes a huge difference in how quickly I can get started with my writing. I absolutely hope it will do the same for you! So I've already mentioned a few times now that life is messy and sometimes writing doesn't happen, but that doesn't mean you can't be working on your book. Even when you make writing a priority (which you absolutely should), if you have a busy life--children, school, work, etc--chances are there will be a day when you just can't get the quality time you need to write. But these interruptions can hurt more than your wordcount. Like I mentioned above, novels live in our heads. Every day we spend out of our worlds not thinking about our stories, we drift further away from the excitement and inspiration that made us want to write them in the first place. We are basically putting down our own book, and we all know what happens when you put down a book: there's always that chance you'll never pick it up again. Thankfully, avoiding this tragedy is pretty simple, because while there may well be days when you simply can not write, there will never be a day when you can not think about your story. You are the master of your headspace, and even on the busiest days, no one can stop you from imagining your own worlds. So, when a bad day hits, try to do just that. Even if you can't write, keep your head in your novel. You don't even have to solve any problems if you don't want to. Just think about your characters, imagine their interactions, daydream about your world, do whatever it takes to keep yourself in your book, even when you're not actually able to get the words down. If you do this, then when you do finally get time to write, you're going to be bursting with new ideas and chomping at the bit to get your story down, which is a pretty good way to return to daily writing. :) Whatever happens, though, whatever giant interruptions life throws your way, you can't let yourself drift too far away from your story. That's how novels die: not from author laziness, but from author inattention. Books are like children: they need love and attention to thrive. Even if you can't actually get the words down, you can always lavish those things on your story. It's not quite as good as actually getting writing time, but a day when you think of a new idea and get super excited about your writing again is never wasted. And those are my tips for NaNo! I hope you enjoyed them, and I wish you all the best writing in November (or, you know, today! There's no rule that you can only write books in November!) If you enjoyed this post, please follow me on social media (Twitter, Facebook, Tumblr, Google+) or subscribe to the blog directly via Feedburner. I do new writing posts every Wednesday and post lots of publishing business/fun stuff in between. It's a working writer's world here at Pretentious Title! Thank you all as always for reading, and Happy NaNo! I remember that the NaNoWriMo people said in previous years that you had to start a new novel or be considered "a NaNoWriMo rebel." However, this year's FAQ states "You win NaNoWriMo by writing 50,000 words of your novel between November 1 and November 30." (see http://nanowrimo.uservoice.com/knowledgebase/articles/329135-how-do-i-win-nanowrimo-what-are-the-prizes-is-th ) so you're absolutely right that it's best to start in October and continue the same story during NaNoWriMo, but with a word count of zero (so the October stuff doesn't count, but won't make you a rebel either). Great post. I loved that NaNoWriMo calendar you posted. Are you going to post everyday during NaNoWriMo? Thanks for sharing this best stuff with us! Keep sharing! I like the way of writing and presenting the information.Waiting for new stuff. Nice and informative post about essay writing service . I hope you will write more detail and great content soon..